30.01.2011 » Osasuna 1-0 Real Madrid. Spanish league title hopes almost crushed. Real Madrid were unable to bring January to a close with a win afer getting defeated against Osasuna by 1-0. Camuñas scored the lonely goal on minute 62 and Real Madrid players were unable to change things. Osasuna took to the pitch in high gear and never gave Real Madrid any breathing room. 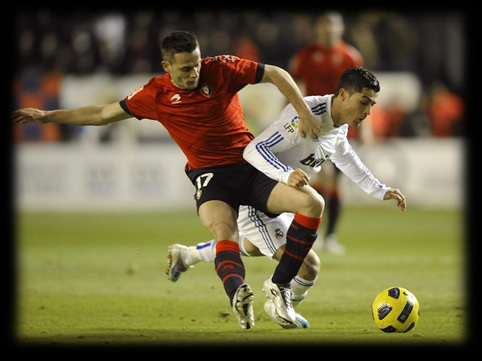 With a tremendous physical effort, Osasuna kept Real Madrid off-balance and uncomfortable. Pandiani nearly scored the first goal of the night but his header sailed over Iker Casillas’ crossbar. Real Madrid’s best chance came on 34’, but Karim Benzema’s shot was cleared by the goalkeeper, Ricardo. Osasuna took their foot off the gas as the first half wound down and the Whites managed to combine and create chances. Cristiano Ronaldo could have given Real Madrid the lead on 41’ but the keeper made another outstanding save. Not much changed after the restart with Osasuna pouring on the pressure on the final third of the pitch. Spurred on by the home crowd, the hosts grew more confident and saw their effort rewarded on 62’. Aranda found Camuñas between two Madridista defenders and the Madrid native beat Iker Casillas with a shot off the post. Real Madrid had over half an hour to respond and turn things around. José Mourinho made a triple change with Kaká, Xabi Alonso and Adebayor coming off the bench in search of much needed offense. Real Madrid controlled possession of the ball and created plenty of chances, but none found the back of the net. Karim Benzema came close to equalizing on 73’ but his header was off target. Adebayor also had a try but Ricardo had little trouble trapping the header. Minutes ticked off, the equalizer was nowhere to be found and Osasuna held on for the 1-0 win. Despite Cristiano Ronaldo efforts, Real Madrid couldn't apply a "remontada", and Real Madrid is now 7 points behind leaders Barcelona, who won their match yesterday against Hércules. Cristiano Ronaldo and his teammates will now play against Sevilla for the 2nd leg of the Copa del Rey next wednesday, after having won 1-0 in the first game.